Facebook blocked in Vietnam [Socialist Republic of Vietnam ] over the weekend due to citizen protests !! Cộng Hòa Xã Hội CHũ Nghĩa Việt Nam đã chận các ngõ thông-tin của Facebook trong nước, cuối tuần vừa qua !! Facebook appears to have been blocked in Vietnam as a part of a government-imposed crackdown on social media, amid public protests over an environmental disaster attributed to toxic discharges from a steel complex built by Taiwan’s Formosa Plastics. Dissidents are blaming wastewater from the steel plant for a mass fish death at aquatic farms and in waters off the country’s central provinces. Citizens have been using Facebook to organize rallies, which is likely the cause of the shutdown. Instagram also appears to have been affected, according to reports. In addition to helping protesters organize, social media has been used to share photos of people at rallies, holding up handwritten signs that read "I choose fish"
Citizens are angry both at the steel company and their government’s inaction. Formosa had denied wrongdoing in the matter, and the Deputy Minister of the Environment and Natural Resources said the fish deaths had been caused either by a toxic algae bloom or industrial waste. He also denied that Formosa was to blame. Police arrested up to 300 protesters in Ho Chi Minh City’s Paris Square, and many injuries were sustained during that process. Protesters tried to rally for the third time on Sunday, but security in Hanoi and Ho Chi Minh City prevented major rallies taking place, Reuters reports. The fish kill began in April, and a government investigation is still underway. According to the Israeli proxy service Hola, whose software would be used to route around internet censorship like this (and which is capitalizing on this situation by way of press releases), both Facebook and the photo-sharing app Instagram were blocked on Sunday. The company says it experienced a significant surge in downloads following the Facebook blockade. “Though security forces have been preventing protesters from gathering in Hanoi and Ho Chi Minh City, many citizens have been using Facebook to exchange information and organize rallies, thus the government is presumed to have shut the website down,” the company wrote on its blog. We’ve confirmed via app store optimization firm Sensor Tower that mobile VPN applications in the country also saw a huge boost as users there are trying to circumvent the block. (See above chart). This pattern is similar to when WhatsApp was blocked in Brazil, and is a fairly good indication that a Facebook blockage was, indeed, in effect. As another source of confirmation of sorts, the Head of PR & Comms for Opera & Asia posted on Twitter that their company saw a surge of VPN users from Vietnam, and suspected a Facebook block was to blame. There are a number of Twitter reports of a blockage as well. Vietnam’s government has blocked social media off and on over the years, though more recently leaders appeared to be embracing Facebook. In October, Bloomberg reported that Vietnam’s Communist government even set up its own page on the network dubbed “Government Information,” in an effort to reach the 30 million citizens who used the service. Facebook has not yet responded to a request for comment. It’s unclear at this time if the ban, implemented to crack down on the Sunday protests, is still in effect. It appears it may have been lifted, however, according to websites that track outages like outage.report and DownDetector. It’s also unclear if it extended outside of Hanoi and Saigon, where the demonstrations were planned. Last edited by TL Reporter on Wed May 18, 2016 12:32 am, edited 7 times in total. Facebook bị chặn, người biểu tình sẽ đối phó với một Thiên An Môn Việt Nam? Thông tin từ nhiều người dân ở Việt Nam cho hay, trong ngày hôm nay 14/05 họ đã không vào được mạng xã hội facebook nữa! Thông tin facebook bị chặn vẫn còn được xác nhận vào lúc 9 giờ tối Việt Nam Thứ Bảy 14/05, bởi một số người sống tại Sài Gòn. Tuy nhiên, một người sử dụng Galaxy Note đã được điều chỉnh thì vẫn vào được. Cùng lúc với hiện tượng bất thường này, các phương tiện truyền thông trong nước hôm nay đã đồng loạt đưa tin “…các đợt tụ tập này do Tổ chức Khủng bố Việt Tân ở hải ngoại móc nối với nhiều phần tử bất mãn cùng một số đối tượng có tiền án, tiền sự tại Việt Nam thực hiện…”. Trên báo điện tử Người Lao Động còn thông tin: “…Đã có 4 trật tự viên Thanh niên xung phong tham gia giữ gìn an ninh trật tự bị thương, do một số phần tử quá khích đã manh động chống đối, tấn công…”. Họ kêu gọi trả lại sự bình yên cho đời sống người dân tại Việt Nam. Kết hợp hai sự kiện này lại với nhau, có nhiều dấu hiệu cho thấy chính quyền CSVN có thể đã chuẩn bị cho một kịch bản đàn áp đẫm máu theo kiểu “Thiên An Môn” đối với người biểu tình ôn hòa. Mục tiêu chính là ngăn chặn cuộc biểu tình ngày mai, không để cho lan rộng đến ngày 22/05, sẽ xảy ra hai sự kiện quan trọng cùng lúc: Việt Nam đón tổng thống Obama và cuộc bầu cử quốc hội. Các người tham gia trong nước đã nhanh chóng thông báo cho nhau biết, và chuẩn bị đề phòng. Một số người thông báo các cách vượt tường lửa để có thể vào facebook trở lại. Một số tin tưởng rằng dù không có facebook, nhưng đã có rất nhiều phóng viên báo chí ngước ngoài đến Sài Gòn, Hà Nội trong những ngày qua để đưa tin về các vụ biểu tình. Họ sẵn sàng bị đàn áp, và tin rằng thế giới vẫn sẽ nhận được đầy đủ tin tức. Facebook là phương tiện truyền thông hữu hiệu đối với những người tham gia biểu tình ôn hòa tại Việt Nam, khi mà tất cả các phương tiện truyền thông chính thống đều bị nhà nước kiểm soát. Người biểu tình thông tin cho nhau qua mạng facebook, gởi những hình ảnh về cuộc biểu tình, về cảnh côn an đánh đập người biểu tình ôn hòa cũng bằng Facebook. Thông tin trên Facebook đã kêu gọi sự chú ý của thế giới đến tình hình Việt Nam, đồng thời tạo nên một làn sóng bất mãn trong nhiều người dân Việt, vốn trước giờ vẫn còn thờ ơ đến tình hình chính trị của đất nước. Tình hình xem ra đã trở nên căng thẳng hơn bao giờ hết! SBTN sẽ tiếp tục cập nhật thông tin đến quí độc giả. Last edited by TL Reporter on Wed May 18, 2016 12:03 am, edited 3 times in total. The government of Vietnam allegedly shut Facebook down on Sunday, and so far 200,000 citizens have turned to Hola, a popular VPN service, to fight the censorship and access the website. The decision to block Facebook, as well as photo-sharing app Instagram, came as dissidents tried to rally for the third successive Sunday to protest for an environmental disaster they claim was caused by the Vietnamese government and Taiwan's Formosa Plastics. The disaster is said to have killed a large number of fish in April. Though security forces have been preventing protesters from gathering in Hanoi and Ho Chi Minh City, many citizens have been using Facebook to exchange information and organize rallies, thus the government is presumed to have shut the website down. Israeli proxy service Hola experienced a massive surge of downloads of the popular app and browser extension in Vietnam in the hours following the Facebook blockade. "As the Internet becomes the mainstream method of exchanging information between people, more and more governments, service providers and corporations are closing down on the Internet citizens' freedom of information. Hola's P2P technology removes these barriers and makes the Web worldwide again," said a spokesperson from Hola. While some Vietnamese may have chosen to communicate through other social media channels, many of them preferred to rely on a VPN service to continue using Facebook. Most VPNs cost between five to ten dollars a month. In a country as Vietnam, where the average monthly wage is around $150, a VPN approaches 1% of monthly family income, a disproportionate amount of money to spend on such service. VPNs are so expensive because they need to pay for the costly servers through which their users' traffic pass, and they ought to make a profit from it, as well. The reason why hundreds of thousands turned to Hola is that the service is free of charge due to its P2P technology. Hola's peer-to-peer (P2P) nature, in fact, does not rely on any server, so there is no underlying cost of service. Its users surf the internet anonymously by securely routing through other users' computers when these are not in use. Hola is free for non-commercial use only; the company profits from Luminati, the same proxy service offered to businesses for commercial use. This enables Hola to provide the non-commercial service free of charge. Since its launch in 2013, the service has been used by 80 million people in multiple countries to democratize the web. Earlier in May, for instance, WhatsApp users located in Brazil installed Hola to access the messaging app, which had been blocked by the government due to a court ruling. Last edited by TL Reporter on Wed May 18, 2016 12:23 am, edited 1 time in total. For the third weekend in a row, public protests have taken place in Vietnam — a rare occurrence in a country whose government is described by Human Rights Watch as one of the most repressive in the world — following the mysterious death of an estimated 100 tons of fish which washed ashore in the country's impoverished central coastal region last month. Large groups of plainclothes and uniformed police stifled protests in Vietnam's two largest cities on Sunday — the northern capital city of Hanoi and southern Ho Chi Minh City — came little more than a week before US President Barack Obama's high profile official visit to the country is due to commence. The previous weekend, thousands of people demonstrated in rallies which were forcibly broken up with participants tear gassed and beaten by police, according to the United Nations' human rights office. In preparation for Sunday's protests, government-run telecom firms blocked access to social media sites such as Facebook and Instagram, and one of the country's largest state-run newspapers carried a report in which a Ho Chi Minh City police spokesperson said the protests had been organized by a "terrorist organization." The blame for the fish deaths has been widely leveled at Taiwanese firm Hung Nghiep Formosa Steel Company in the Vung Ang Economic Zone in Ha Tinh Province. State media reported that an unnamed group of fishermen led Vietnamese reporters to an underwater waste disposal pipe linked to the company, which they claim is the source of the toxins that killed the fish. Government authorities have previously said there was no link between the plant's activities and the fish deaths, but have demanded the company dig up the pipe. Meanwhile, the Taiwanese conglomerate, which has a long history of pollution scandals that have erupted in Cambodia and Taiwan, as well as in the United States, has bungled the handling of the situation. Last month Hung Nghiep Formosa executive Chou Chun Fan told reporters, "You have to decide whether to catch fish and shrimp or to build a modern steel industry; even the Prime Minister can't choose both." Vietnamese media reported that he was subsequently fired, according to Reuters, though this could not be confirmed — meanwhile his comments galvanized a protest movement that rallied under banners declaring "Toi Chon Ca" ("I choose fish"). The hashtag #toichonca has trended on social media since. Police covering protester’s mouth in Saigon, Vietnam. Neither Hung Nghiep Formosa nor the Taipei Economic and Cultural Office in Hanoi (similar to an embassy) responded to questions sent to them by VICE News. The company has publicly denied any wrongdoing, and Vietnam's government has issued a string of apologies and conflicting explanations. During a press conference, a Deputy Minister of the Environment and Natural Resources said the deaths had been caused either by a toxic algae bloom or industrial waste, but insisted no evidence linked Formosa to the event. The World Wildlife Fund's office in Hanoi said it was awaiting confirmation of the cause of the fish deaths from the government and referred all inquiries to the Vietnam Fishery Administration, which didn't respond to emails or phone calls. Government scientists have promised the results of an official investigation will come "soon." In the meantime, the government has stifled public gatherings, ahead of Obama's arrival in the country on May 23 — the day before National Assembly elections are due to be held. Last week, police encircled thousands of protesters in Ho Chi Minh City's Paris Square, and up to 300 people were dragged away to a nearby stadium to be photographed, fingerprinted, and made to sign confessions. Others sustained injuries as the demonstration was broken up. "There aren't as many of us this week because every time we try to raise our voices, they try to stand in our way," said Khang, a 32-year-old IT technician, as he stood among hundreds of protesters in Ho Chi Minh City's September 23 Park on Sunday. While he spoke, government loudspeakers blared and police officers pushed protesters toward buses waiting to ferry them away from the park. "Attention! This is the law enforcement forces speaking. The cause of the mass fish deaths in four coastal central provinces remain the concern of lowly people. The national and local governments, scientists at home and from overseas are working to identify the causes," said a recording in garbled English that was played repeatedly. Elsewhere in the city, police shut down a small square in front of the municipal government's assembly building, ahead of another planned protest. At dusk, September 23 Park was cordoned off by uniformed police and military officers, including a small contingent wearing shock helmets and bullet proof vests, who forced a large number onto the buses and ferried them away from the park. According to Professor Le Viet Phu, a lecturer of Environmental Economics and Policy at the Fulbright Economics Teaching Program in Ho Chi Minh City, while the recent fish kill may seem large, it only represents a tiny snippet of the environmental damage to food stocks and natural resources caused by reckless industrial activity. In the past five months, four significant mass fish deaths have been reported throughout the country. "One hundred tons of fish is nothing in terms of environmental impact," said Phu. "But in terms of emotional impact, this has been huge. If the government blames Formosa, the people will come and destroy everything there." Phu claimed that public outrage has been spurred by fear of China's growing dominance in the region, as well as Taiwanese industrial expansionism, with the two countries often conflated and targeted for criticism by protesters. Two years ago, when Chinese ships towed a mobile oil rig into Vietnam's continental shelf, riots exploded in Vietnam, with scores of Taiwanese factories suffering heavy damage and at least one Chinese worker killed. The crackdown so soon before Obama's visit will likely cause anxiety among US arms manufacturers, whose representatives gathered at an arms fair in Hanoi last week amid hopes the US president would lift a US embargo on lethal weapons sales to Vietnam — a move likely to draw more scrutiny at a time of heavy-handed policing in the southeast Asian nation. Meanwhile, two petitions on the White House website related to the fish kill and environmental damage in the affected region have drawn over 150,000 signatures. Adding further tension to the situation, the office of the United Nations High Commissioner on Human Rights mentioned the protests in a statement published on May 13. 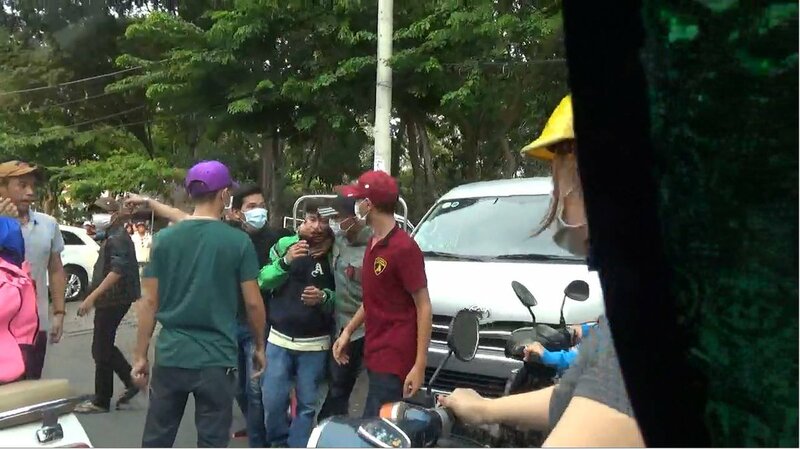 "We are concerned about the increasing levels of violence perpetrated against Vietnamese protesters expressing their anger over the mysterious mass deaths of fish along the country's central coast," it said. "We urge the Vietnamese authorities to adopt legal and institutional frameworks that protect against environmental harm that interferes with the enjoyment of human rights." CSVN chặn Facebook, vu khống người biểu tình - đàn áp sẽ gia tăng trong những ngày tới...?!!! Thông tin từ nhiều cư dân mạng ở Việt Nam cho hay, trong ngày hôm nay 14/05 họ đã không vào được mạng xã hội Facebook nữa. Thông điệp của người biểu tình vì môi trường. Nhiều blogger cho biết đã phải vượt tường lửa để truy cập Facebook. Họ nhanh chóng thông báo cho nhau các cách vượt tường lửa để có thể vào Facebook trở lại. Một số nói rằng họ tin tưởng dù không có Facebook, nhưng đã có rất nhiều phóng viên báo chí ngước ngoài đến Sài Gòn, Hà Nội trong những ngày qua để đưa tin về các vụ biểu tình. Họ sẵn sàng chấp nhận bị đàn áp, và tin rằng thế giới vẫn sẽ nhận được đầy đủ tin tức. Facebook là phương tiện truyền thông hữu hiệu đối với những người tham gia biểu tình ôn hòa tại Việt Nam, khi mà tất cả các phương tiện truyền thông chính thống đều bị nhà nước kiểm soát. Người biểu tình thông tin cho nhau qua mạng Facebook, gởi những hình ảnh về cuộc biểu tình, về cảnh công an đánh đập người biểu tình ôn hòa. Thông tin trên Facebook đã kêu gọi sự chú ý của thế giới đến tình hình Việt Nam, đồng thời tạo nên một làn sóng bất mãn trong nhiều người dân Việt, vốn trước giờ vẫn còn thờ ơ đến tình hình chính trị của đất nước. Cùng lúc với hiện tượng Facebook bị chặn, các phương tiện truyền thông trong nước hôm nay đã đồng loạt đưa tin Đảng Việt Tân, một đảng phái chính trị đối lập của người Việt Nam có trụ sở tại Hoa Kỳ, đã "tổ chức gây rối", "kích động bạo loạn", qua những cuộc xuống đường vì môi trường của người dân Việt Nam trong những tuần qua. Báo Tuổi Trẻ hôm 14/5/2016 đưa tin: "Chiều 14-5, Công an TP.HCM cho biết qua điều tra, thu thập thông tin đã khẳng định tổ chức khủng bố Việt Tân đã tổ chức các vụ tụ tập đông người, gây rối trật tự công cộng tại TP.HCM vào ngày 1-5 và 8-5. Công an TP.HCM nhận định mục đích của các cuộc tụ tập, gây rối nơi công cộng là tổ chức khủng bố Việt Tân muốn gây rối an ninh trật tự, phá hoại cuộc bầu cử và sâu xa hơn là lật đổ chế độ. Việt Tân muốn tạo ra một sự kiện để kích động các cuộc tụ tập thành một cuộc bạo loạn." Còn báo Người Lao Động nói: "Các đợt tụ tập này do Tổ chức Khủng bố Việt Tân ở hải ngoại móc nối với nhiều phần tử bất mãn cùng một số đối tượng có tiền án, tiền sự tại Việt Nam thực hiện... Đã có 4 trật tự viên Thanh niên xung phong tham gia giữ gìn an ninh trật tự bị thương, do một số phần tử quá khích đã manh động chống đối, tấn công...”. Nói về những cáo buộc trên, ông Hoàng Tứ Duy, Phát ngôn nhân Đảng Việt Tân khẳng định đây là những sự vu khống của nhà cầm quyền CSVN. Ông nói: "Việt Tân không khích động ai cả. Là người Việt Nam, ai cũng có quyền và trách nhiệm lên tiếng trước thảm họa môi sinh. Nhà cầm quyền cần phải tập trung vào giải quyết vấn đề cá chết, đời sống và sức khoẻ của người dân, thay vì tìm cách đàn áp và tảng lờ trách nhiệm khi người dân lên tiếng. Biểu tình ôn hoà là quyền của mọi người dân Việt Nam, và là phản ứng tự nhiên khi nhà cầm quyền thờ ơ trước vấn đề sức khỏe lâu dài của dân tộc bị đe dọa. Anh chị em Việt Tân sẽ tiếp tục cùng người dân trong và ngoài nước đòi hỏi 'nước sạch - chính quyền minh bạch' cho đến khi vấn đề được giải quyết tận gốc." Nhà cầm quyền cũng cho biết những người dân đi biểu tình đã bị tổ chức Việt Tân mua chuộc, trả tiền. Báo Tuổi Trẻ nói: "Theo Công an TP.HCM, Việt Tân đã chỉ đạo một số đối tượng chống đối trong nước hình thành các nhóm hỗ trợ cho những người tham gia tụ tập gây rối. Biểu hiện cụ thể là có những nhóm chuẩn bị nước, bánh mì, phát tiền cho người tham gia, khi đúng thời gian ấn định thì những người tụ tập đều đứng dậy, ra khẩu hiệu..."
Những thông tin trên được truyền thông trong nước loan truyền mạnh mẽ, tạo nên một làn sóng giận dữ trên mạng, đặc biệt đối với những người đã từng xuống đường vào hai cuối tuần vừa qua. Một tuyên bố được Nhạc sĩ Tuấn Khanh đăng tải trên Facebook trong vòng vài tiếng đã có hơn một chục ngàn người đồng tình và "like". Anh viết: Chúng tôi, những người dân Việt Nam, bác bỏ những luận điệu vô căn cứ đó, cũng như bác bỏ mọi cáo buộc ngu ngốc về việc bị "xúi giục", "nhận tiền"... và khẳng định cách tuyên truyền đó, chỉ giới thiệu một bộ máy thông tin vừa cũ mòn, vừa bệnh hoạn. Chúng tôi, những người dân Việt Nam, cảm thấy khinh bỉ các bản tin như vậy, bởi ai ai cũng biết việc xuống đường của hàng ngàn người từ nhiều tuần nay do bất bình trước sự tắc trách và mờ ám của các cơ quan nhà nước sau sự kiện Cty Formosa Hà Tĩnh cố ý xả độc vào môi trường sống của người Việt Nam. Chúng tôi, những người dân Việt Nam, đòi hỏi sự minh bạch về nguyên cớ của nạn hủy diệt môi trường đang lan rộng, và chất vấn chính quyền về sự ám muội nào đã cho phép Formosa được hình thành tối huệ và càn quấy trên đất nước này. Chúng tôi, những người dân Việt Nam, biết rõ chính quyền đang chọn đàn áp nhân dân thay vì đối thoại và minh bạch. Tuy vậy, danh dự và trách nhiệm với tổ quốc khiến chúng tôi vẫn chọn việc xuống đường ôn hòa, bất chấp mọi âm mưu. Được biết trong những ngày này, lực lượng công an, an ninh đã canh chừng gắt gao trước cửa nhà của những người hoạt động, cũng như nơi ở của các sinh viên ở Sài Gòn và Hà Nội. Một nguồn tin cho SBTN biết công an đến 12h khuya vẫn còn đi kiểm tra hộ khẩu nhiều nhà. Có nhiều dấu hiệu cho thấy chính quyền CSVN có thể đã chuẩn bị cho một kịch bản đàn áp thẳng tay đối với người biểu tình ôn hòa. Mục tiêu chính là ngăn chặn cuộc biểu tình ngày mai, không để cho lan rộng đến ngày 22/05, sẽ xảy ra hai sự kiện quan trọng cùng lúc: Việt Nam đón tổng thống Obama và cuộc bầu cử Quốc Hội CSVN.